I haven’t gotten angry much during this whole process. There have been a lot of tears, fears, and questioning but really very little anger. I was taken aback when one line in one article made me see red, “While Audrey is shying away from the media…” I’m not really sure why that did it but my blood pressure raised and I had to walk away. I could not finish reading that article. Let me tell you a story. At about 5am Thursday, April 3rd I made two phone calls to my parents and brothers to tell them that I was about to be intubated and placed in a coma and that I loved them. This conversation happened after much arguing and bargaining with the doctors. I wanted more time. I wanted to wait until about 7am when I could speak to my babies and tell them I loved them. We were told in no uncertain terms that if they did not do it right then I would die. Marc made the most difficult decision to override my wishes and tell the doctors to do it. Those two phone calls are the last things I remember from before they put me under. I am blessed that I do not remember having to say goodbye to Marc; although, I did get a very good laugh when he told me that I begged him to take care of the cats even though he doesn’t really like them and to make sure he took the boys to the Easter bunny. I was me right until they put me under. When I woke up I was surrounded by my family and some of my closest friends. I was just so happy to see them that I did not really question why there were not more visitors. I was under quarantine and everyone had to suit up before they could see me. I thought maybe that was the reason. 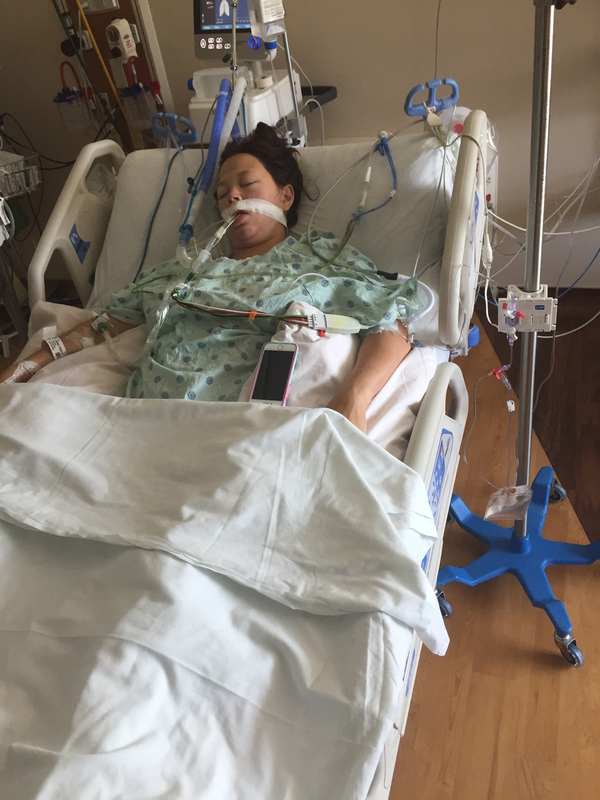 My wonderful, amazing family were protecting me from the truth for as long as they could which was that our local media had tried to get into the ICU to take pictures of me. Other media were calling and trying to get information. At the very worst moment of my family’s life they were trying to get a story and make a buck. I will never even come close to forgiving them for that. Due to their complete disrespect Marc had to come up with a list of a maximum of 10 people who would be allowed to see me. Anyone who called for any reason would have to give a password. I try not to think about this because when I do many, many emotions surface that I do not know how to comprehend. Yes, I chose to marry a professional golfer. I knew the media would be part of our lives. I just never imagined that I would be the subject of their stories. I have never wanted the attention and would have been happy to stay on the outside of the ropes, supporting my husband quietly. I do not blame the media for wanting information. I understand they have jobs to do. I do blame those particular people for being absolutely disgraceful in their attempt to get it in those early few days. I think that maybe it is just a little understandable why my family would not have wanted that in the papers when they were unsure whether I was even going to survive. Maybe that’s just me though. Like I said, I’m a little angry. I’ll get back to the comment about me shying away from the media. It was a harmless comment and it is the truth. What I don’t understand is why it needed to be written at all. Marc and I have had a great relationship with the media. When I had been out of the hospital for about a week I gave my first interview to our friend Ben Everall, one week later I spoke with Tim Rosenforte, and a week after that I spoke with Helen Ross…while I had pink eye no less. They were all lovely and respectful and I did not hesitate to speak with them. Marc has spoken to literally anyone who has asked him to. He has done so with appreciation, gratitude, and sportsmanship. I have had to hear countless times how I suffered a near fatal illness. The 5% stat comes out nearly every time a commentator speaks about Marc. It would be difficult for me to move on with those words in my ears. The Monday of the British Open I was not feeling well; it was one of those days that I could not drag myself out of bed. The doorbell rang and I was able to peak around our staircase to see if it was someone I knew. I saw a young-ish man in khakis and a button up with his face pressed up against our window looking in. He did not see me see him. He returned later that afternoon when I was feeling better and asked me to contact him regarding an interview. The number sits in my phone and I sincerely doubt that I will ever dial it. One of the reasons I started this blog is that it is a very weird feeling for everyone to “know” your story but not actually know it. I would have been very happy if no one ever heard about it all but because they have I think it’s better to hear it straight from me. I’ve been watching your whole story unfold from day one. You have more courage than I could ever imagine, and the strength of a nation. I am sorry for the ignorance that our society has placed at your feet. Shame on them. But, I’m so happy to hear that you have started this blog. You’ve made me think twice multiple times on my decisions. I cannot imagine the emotions that went into so many decisions during this time. Our world is grateful you are here to tell us about it. Thank you!